This brilliant, New York Times bestselling novel from the author of the Newbery Medal winner When You Reach Me explores multiple perspectives on the bonds and limits of friendship. Long ago, best friends Bridge, Emily, and Tab made a pact: no fighting. But it's the start of seventh grade, and everything is changing. Emily's new curves are attracting attention, and Tab is suddenly a member of the Human Rights Club. And then there's Bridge. She's started wearing cat ears and is the only one who's still tempted to draw funny cartoons on her homework. It's also the beginning of seventh grade for Sherm Russo. He wonders: what does it mean to fall for a girl-as a friend? By the time Valentine's Day approaches, the girls have begun to question the bonds-and the limits-of friendship. Can they grow up without growing apart? "Sensitively explores togetherness, aloneness, betrayal and love." -The New York Times A Boston Globe-Horn Book Honor Book for Fiction Named a Best Book of the Year by The New York Times, The Washington Post, The Wall Street Journal, The Boston Globe, The Guardian, NPR, and more! REBECCA STEAD is the author of When You Reach Me, which was a New York Times bestseller and winner of the Newbery Medal and the Boston Globe-Horn Book Award for Fiction, and Liar & Spy, which was also a New York Times bestseller, won the Guardian Prize for Children's Fiction, and was on multiple state master lists and best of the year lists. 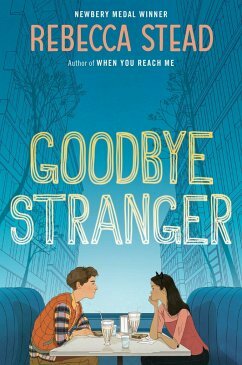 Her most recent book, Goodbye Stranger, was a Boston Globe-Horn Book Honor Book for Fiction and a New York Times bestseller. She is also the author of First Light, which was nominated for many state awards. She lives in New York City with her family. Visit her online at rebeccasteadbooks.com. "A deft and witty coming of age drama"